I picked up a few thrifty items this week. 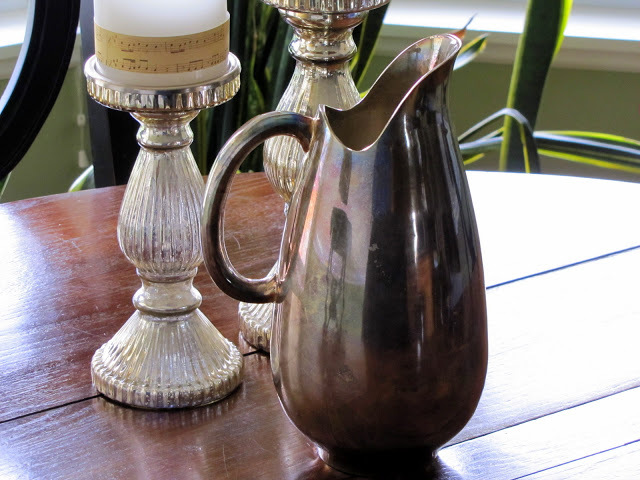 I found this silver pitcher at a local thrift store for $3.93. It’s a little more modern than I normally go for, but it was nicely tarnished and a fairly heavyweight piece, so I scooped it up. I thought it would make a nice vase. 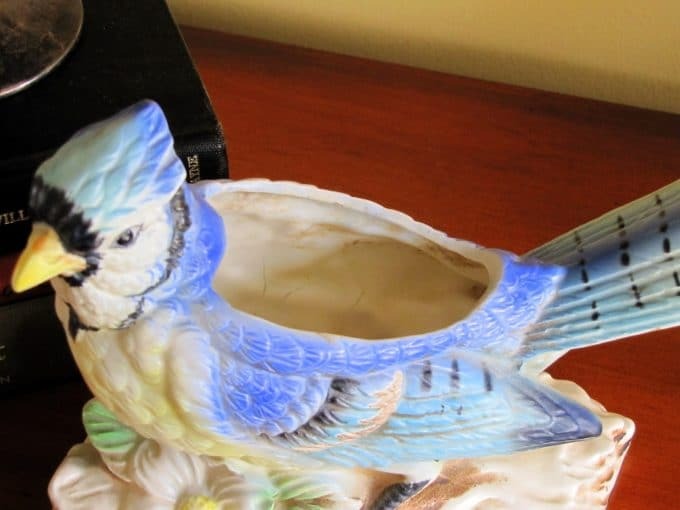 I bought this blue bird (blue jay?) planter at another thrift store for $1.91. It was made by Caffco. I had never heard of Caffco before, but when I researched them I learned that it is a Montgomery, Alabama company that has been in business for 50+ years. Not sure of its age, but it looks vintage. 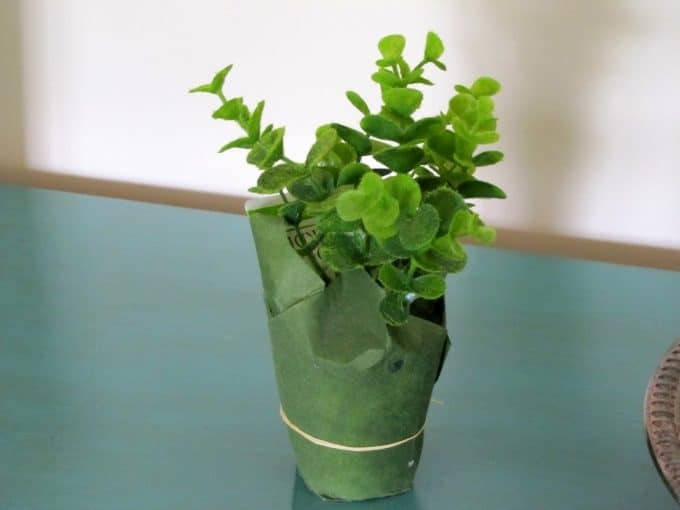 and bought one of their faux greenery pots. For $1.00. Because it is the Dollar Tree after all. He looks pretty chipper considering he has a bush growing out of his back! What a cute little bird, and you can never go wrong with silver! Hi, Pam. I love your finds. 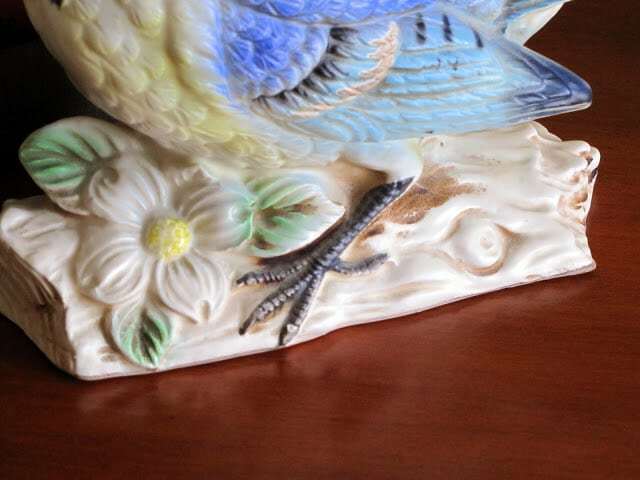 That bird planter turned out so cute! Love the bird planter. What about some real aloe vera? Super finds. 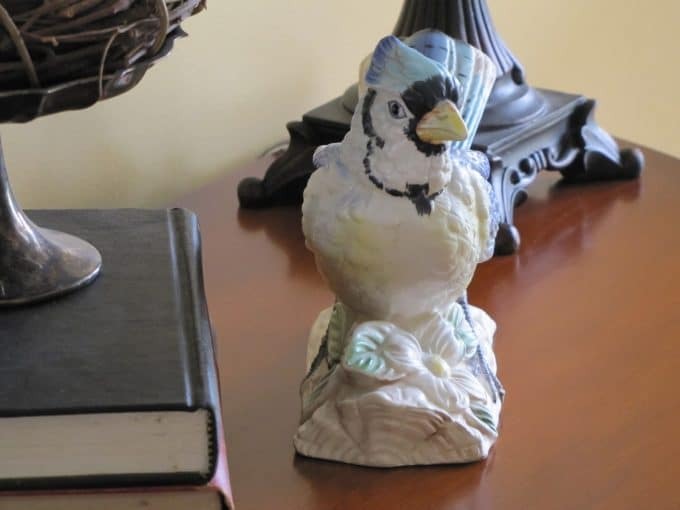 Your silver makes an elegant table display and I adore anything bird related. 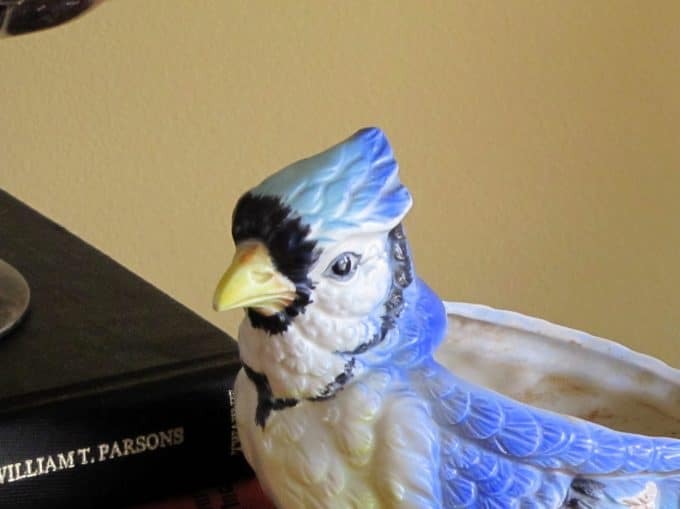 I love your blue jay, what a bargin. and your silver pitcher makes a fantastic pitcher! We used to have tons of blue jays in our neighborhood. I rarely see them now. The pitcher looks fantastic on your dining table. This sounds weird but it seems like you can tell things are vintage by the flowers on them. They just look different. Looks like Spring in your house. I would have snatched that pitcher up, too. I love that pitcher. Looks gorgeous with the blue flowers. You always have the best luck. I love the pitcher and think it looks gorgeous with those flowers in it!! I love how you show us, not only what you found but how you put them together Pam. you did a wonderful job. That modern pitcher fit right in actually, looking quite vintage in your home. 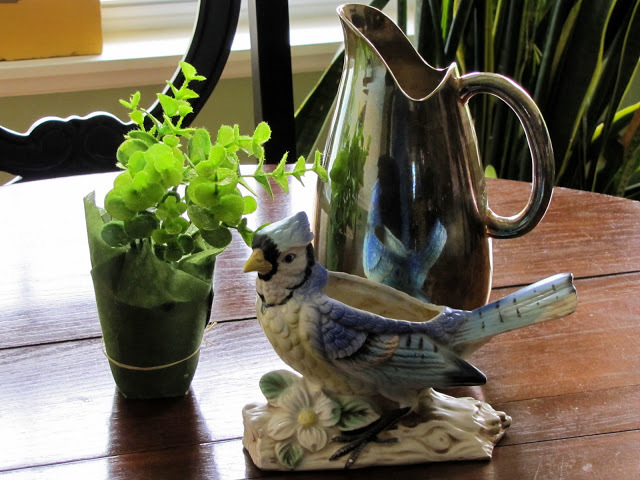 Cute finds…I love the blue jay planter!!! That pitcher is fabulous, Pam! 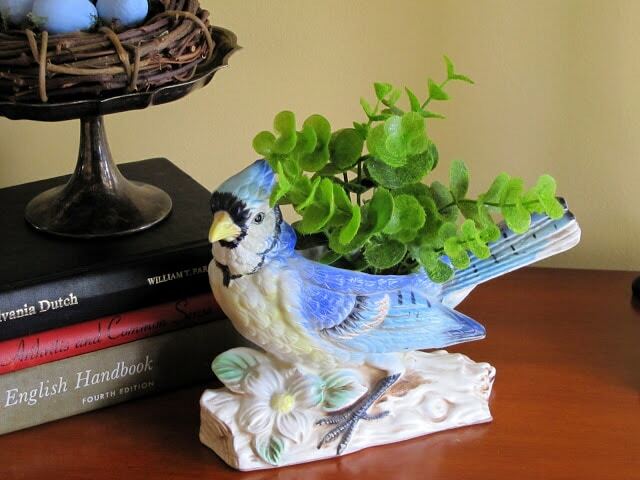 Pam that blue jay is great especially with the faux plant in it! You’ve got a great eye for finding things! One day if you are not busy can you give me the idiot steps for enlarging photos again and then pathetic me can have my 11yr old help me?!! You did great!! I wish we had those prices in NY. Love the Silver Pitcher! It looks like it’s silver plated. Am I right? It’s in great shape. Enjoy. I’m going to a post card show on Saturday. I can’t wait.. Wish you could come. 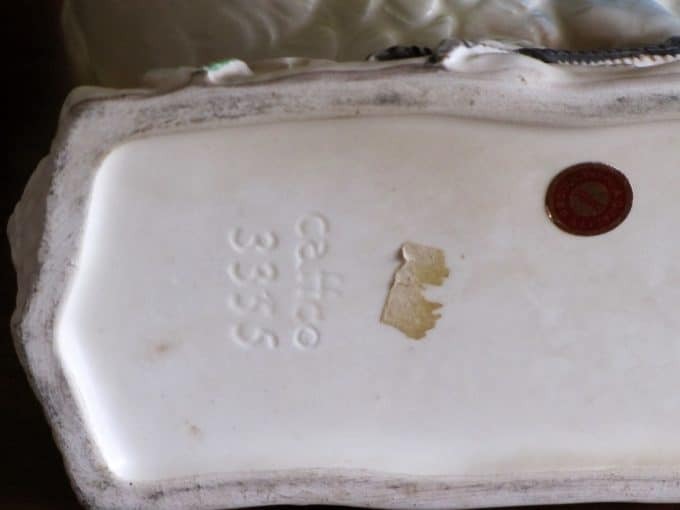 Great finds, Pam! 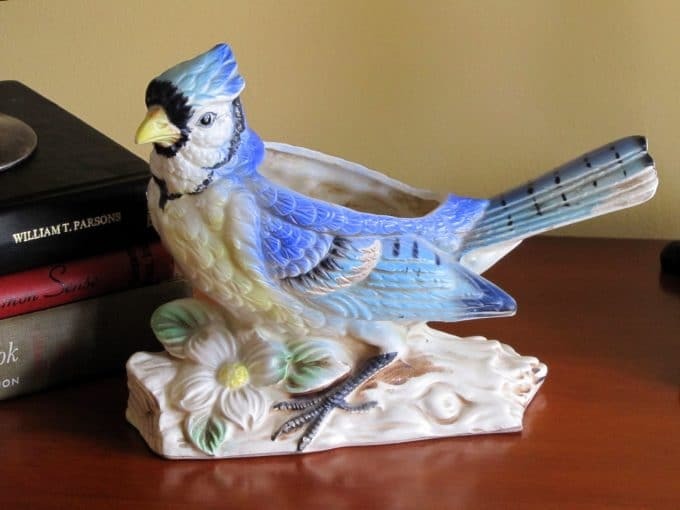 I LOVE that Blue Jay! The flowers looks super in the vase. Wow what great finds. That plant really does look real! The bird is so quant! I remember those from when I was young! Great finds! 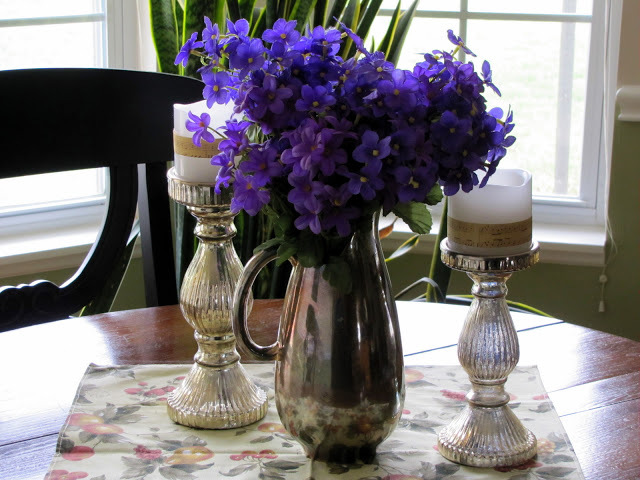 Great finds–the pitcher makes a great vase! Pam, really PLEASE take me with you!!!! 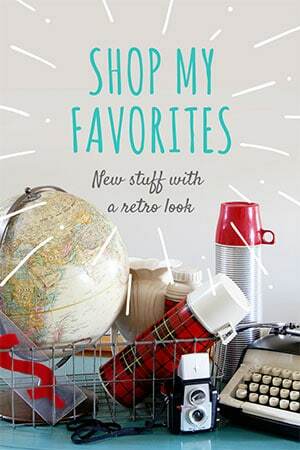 I swear I have always found better stuff the farther north I went…Loving your finds, and that Blue Jay is too cute! 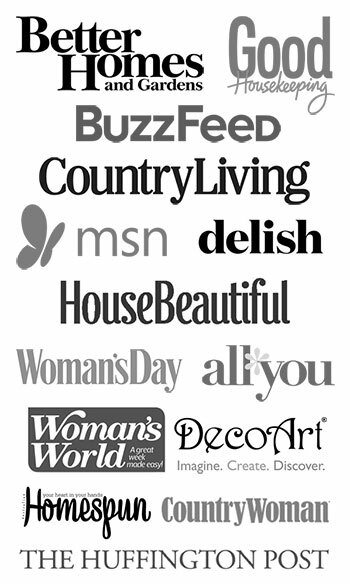 Great finds, for great prices! And that certainly does NOT look like a faux plant!